Hi to all my new recent followers too! Don't be shy, come say hi. I always respond to comments. I'm not going anywhere today but decided to do this because I was bored. I am extremely tired though and I personally think it shows. I look a bit blah and my 'skillz' have gone a bit mediocre. First Light Mineral Blush - Mistral. 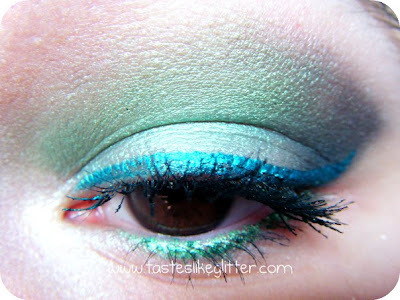 First Light Eyeshadow - Cobalt Sea (all over lid). 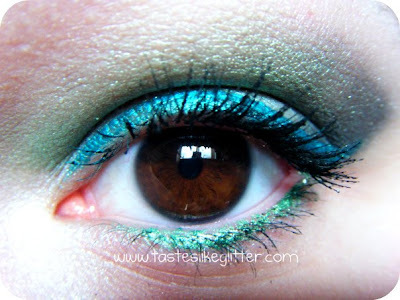 Urban Decay Eyeshadows - Homegrown (crease, lower lashline), Misdemeanor (outer V). Urban Decay Liquid Liner - Minx (upper lashline). 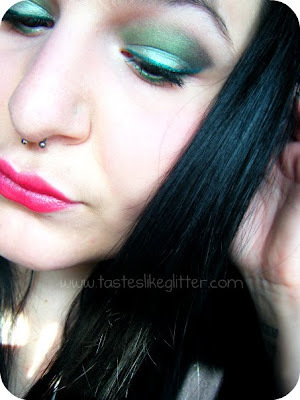 Primark Beauty Eyeliner - Silver Shock (inner corner/brow highlight), Ever Green (lower lashline). I think the reason I don't most so many FOTD's is because I am my own worst enemy. I criticise my work so so much. I'm pretty sure I notice things other people probably don't even notice, because they're not that obvious. I didn't like this when I was doing it or when I was taking photos of it. I actully dislike Urban Decay's Misdemeanor when it's not used over a base like a M.A.C Paint. I was pretty sure I wasn't going to post this but I digress. I actually liked it when I uploaded the photos to my computer.